“Another superb Hammond design is his Cobra Gold®, a fixed-blade combat knife which was meant to satisfy the needs of pilots and other military specialists whose work sees them inhabiting the confines of fighter aircraft and armored vehicles.” (Guns & Ammo’s “Complete Guide to Combat Knives”). The Cobra Gold® fixed blade combat knife was developed in 1986 with input from Air Force F-4 and F-16 fighter pilots, to fulfill a three-fold task for their combat needs: (1) Canopy knife. In the event of an emergency requiring impact fracture of the cockpit canopy, the Cobra Gold’s steep sharpened clip and reinforced tip was designed to serve in that role. The underside of the handle is designed to fit securely in the palm in a hammer grip, enabling the pilot to extricate himself in this manner. 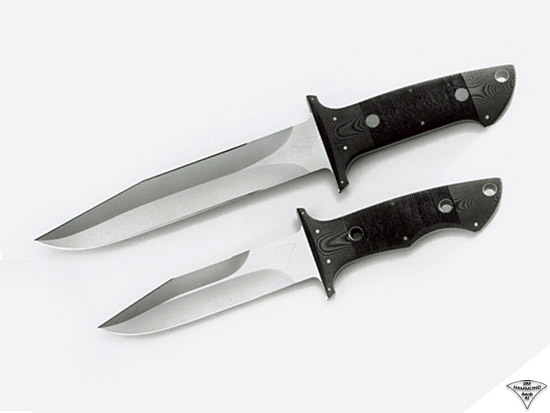 (2) Combat/Fighting knife. When called upon to perform in this role, the Cobra Gold incorporates a battery of close-quarter combat design features. For example, the lower rear arc for the back two fingers serves to accentuate the tip speed in a thrust, and the serrations on the blade back add control in wrist trap maneuvers. It’s sculpted handle with hand-cut serrations and dual guard tips provide a super secure grip under all conditions. (3) Survival knife. When “Escape & Evasion” enter the picture, the knife’s role as a tool becomes paramount. Special Forces personnel have raved about its performance on game preparation in the field. It’s compact size serves well too for food acquisition and preparation tasks in this role. The micarta handle scales are contoured for maximum comfort and control with both a palm and pommel swell. Hand-filed vertical serrations on both sides of the handle are once again available as a custom option, and add significantly to grip purchase under extreme conditions. Three stainless steel lined 3/8” holes in the handle allow for added finger purchase and lashing capability as needed. In service with regular military and special warfare personnel throughout the world, from F-14, F-15 and F-16 fighter pilots and C-130 “drivers” to SEAL Team 6 sniper teams, the Cobra Gold® has earned its place of respect within the ranks.